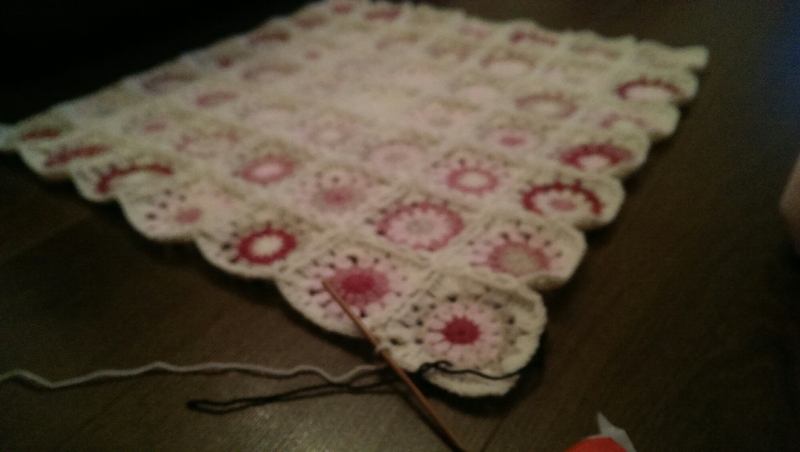 All projects are currently on hold whilst I work on my first customer christmas order. Which if course means all my CALs are a little behind but even though I say they are on hold going to put a day aside to catch up on everything. 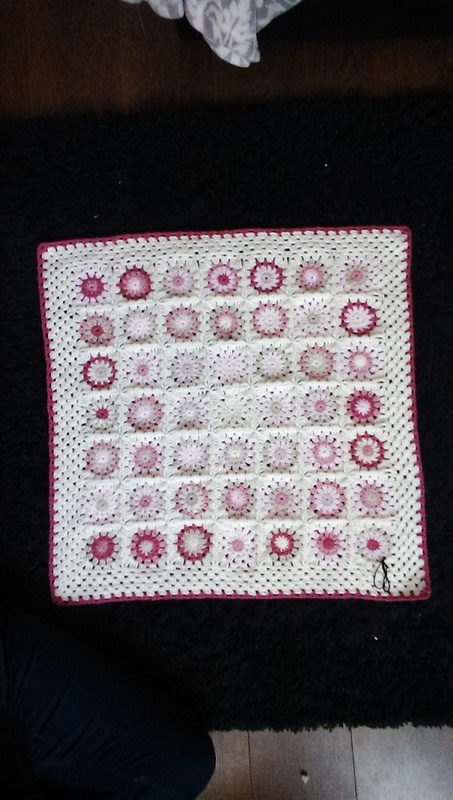 So, I finished this a few days back using a pattern from one of the wonderful designers on the Crochet Playground Facebook page (you should check it out if you haven’t already). It’s a scarf. 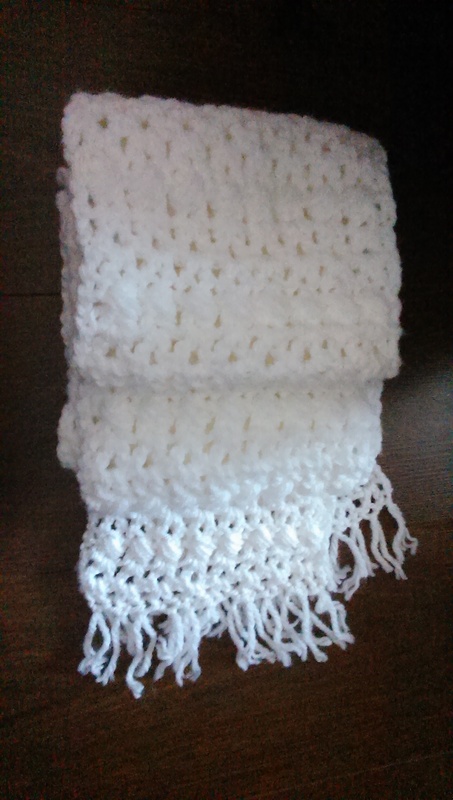 A wonderfully warm and long scarf, made using a 4 row pattern repeat in King Cole Chunky in white. I only added small tassels as I end up with them stuck in all manner of places haha. 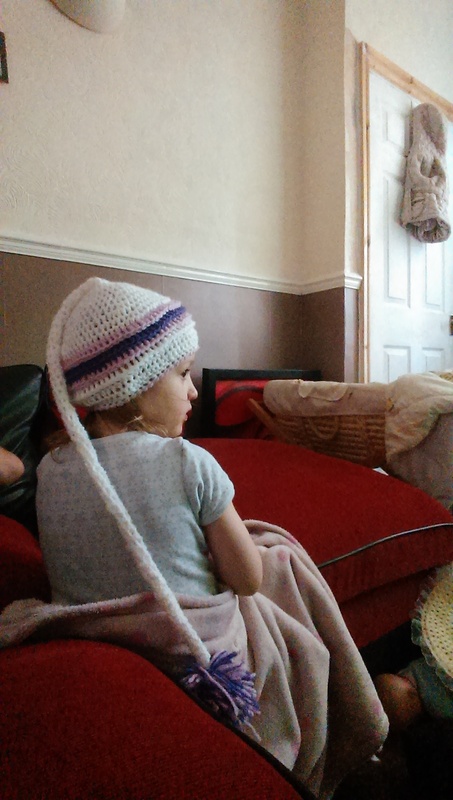 It works up fast and is what I’ve decided will match the Unforgettable cables earwarmer. Forgive the terrible photos. It turns out my back camera on my phone is a little broke and no longer focuses on anything except a really close close-up. This photo is done using my front camera as that can focus but it’s super hard to get a straight picture haha. 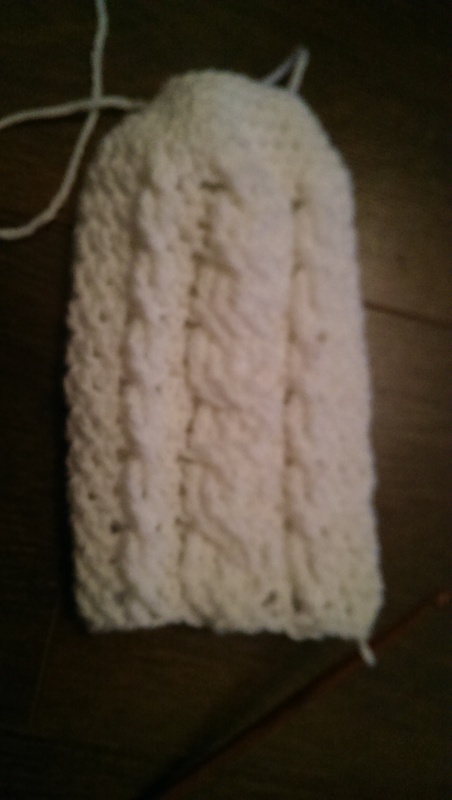 Started on the ‘Unforgettable Cables’ earwarmer. 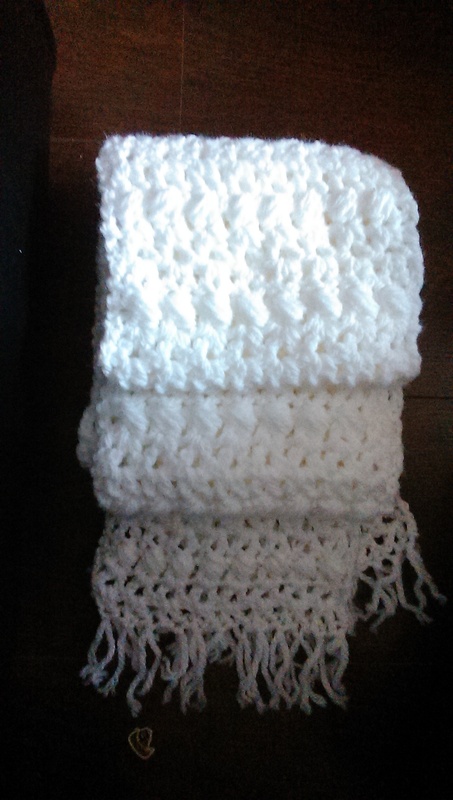 Using just a plain white for this as it’s like snow and is of course, for winter. 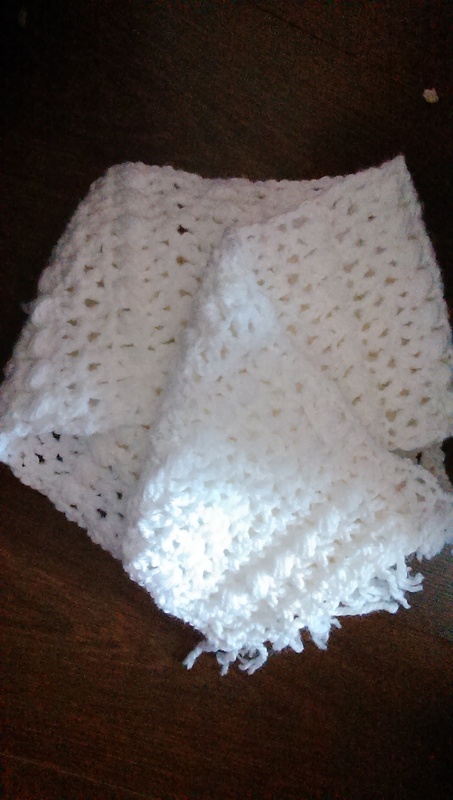 The pattern called for worsted by I’be gone with some chunky and it is super soft and wonderful. …finished today. 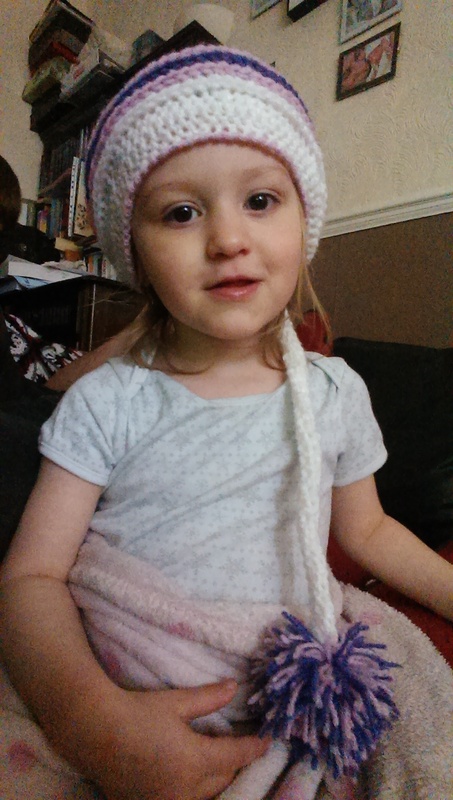 This is the Jazlyn baby hat pattern over on Snappy Tots. It has of course been altered as you all know I often do with patterns. The pattern is for a baby size and that is.just.adorable!! So I’m definitely going to do one in the original size of my baby. 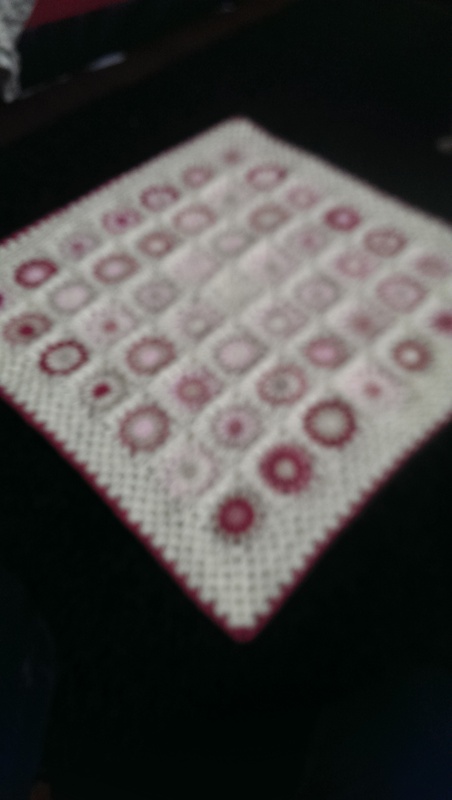 This one I carried on the increasing rounds for a few then started to shape. 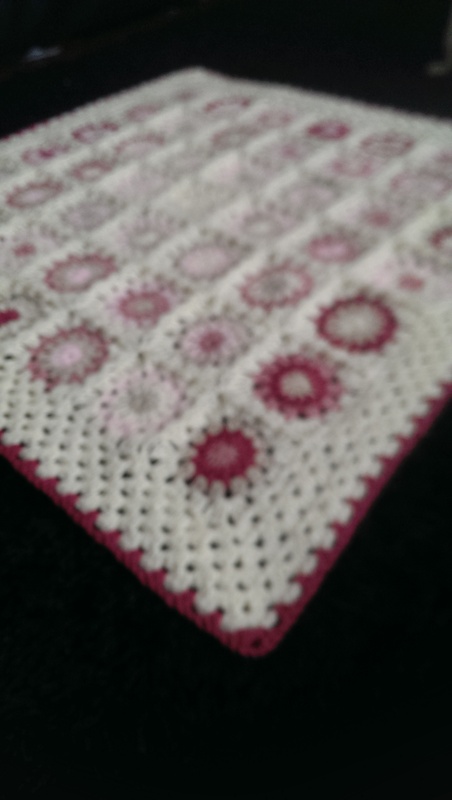 After the layered colour rounds I added a few extra hdc rounds, then sc rounds and finished with a crab stitch round. 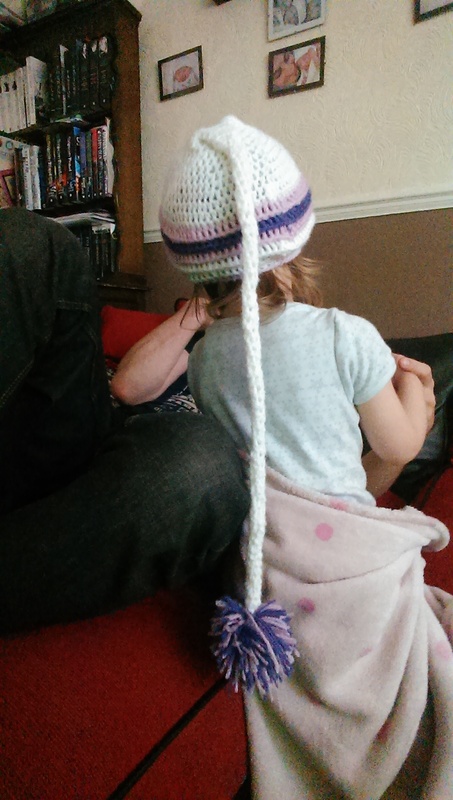 I did also increase the length of the ‘tail’ at the beginning. From what I can tell, I should have left out one or two increase rounds as I had to decrease on a few of the bottom white rounds so it actually fit again, hence the bulging part around the colour. But I’m happy, it works up quick and they are just so darn cute! This one has been sat a while with just the first round of petals, so last night I decided it was time to start working on it again. 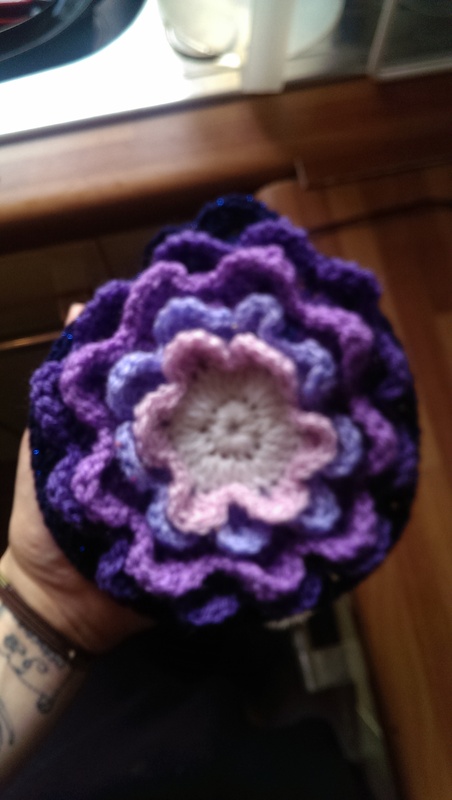 You may recognize it as the ‘Blooming Flower Pillow’ but here’s the difference: I’m going to turn this into a blanket…or rug, instead of a pillow but may add a matching one at a later date. 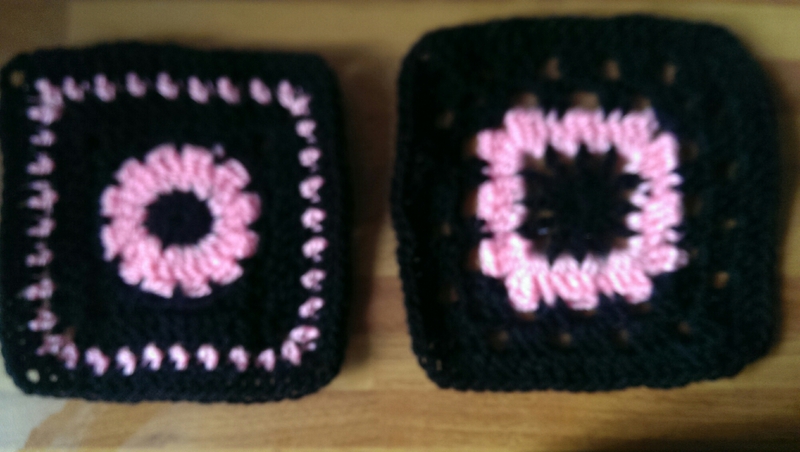 Here are the next two squares for this CAL. 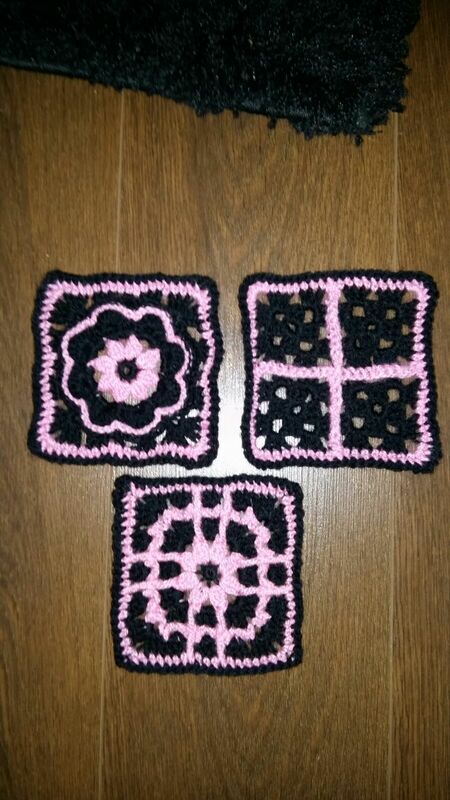 Again, it can be found on FB, along with all the other squares and designers under Mystery Group CAL. 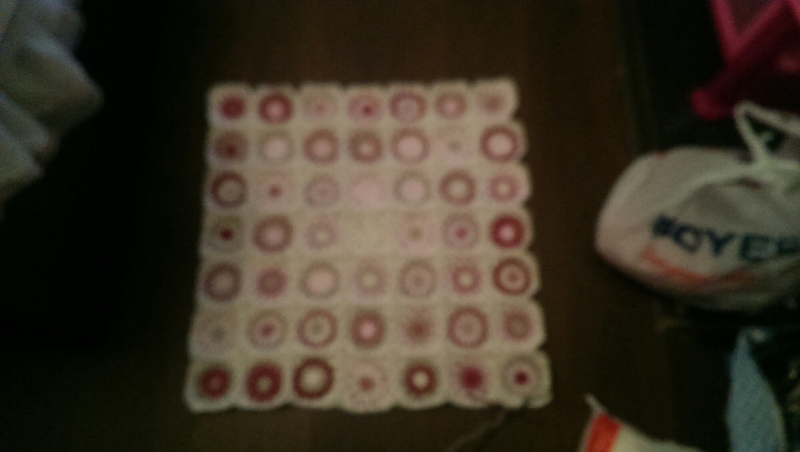 It’s fun doing these and I definitely think I will make more squares to make a blanket rather than a lapghan. Grace is on her way!! The pictures are not the best quality so you cannot full appreciate how pretty it really is.